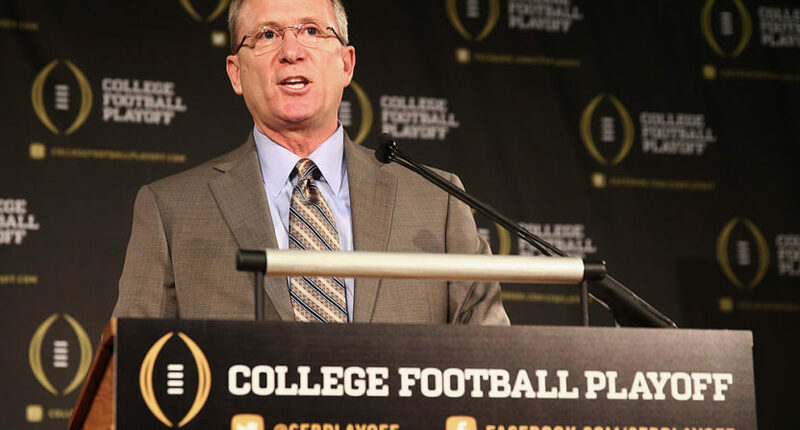 The College Football Playoff will expand to 8 teams eventually. What will it take to get there? Everyone in charge is happy with the four-team system... until they're not. “It’s been a good four years,” said Bill Hancock, the Playoff’s executive director, and he cited TV ratings and reviews of the semifinalists’ experiences and, well, a lot of other stuff during what he termed a “nuts and bolts” meeting — but the best gauge might have been the decision by Delany not to attend. The gist seems to be that the CFP hasn’t caused very many headaches, so why fix what ain’t broke? It’s true that, for the most part, the four-team pairings haven’t caused too many meltdowns. But it has also shown us the potential for disaster lurking around the bend. In 2014, both Baylor and TCU felt legitimately snubbed when the Big 12 co-champions were both passed over for Ohio State (who also passed actual Big Ten champ Penn State by). The CFP came away vindicated when the four-seed Buckeyes upset Alabama and then defeated Oregon to win the national title. But what if they hadn’t? What if OSU had gotten blown out by 50 in the first game? There have been other instances in recent years as well, including the Buckeyes being the ones who felt snubbed last season. Eventually, that disaster is coming, whether those in power in college football want to admit it or not. And instead of a nouveau riche program like Baylor being affected, it’s going to screw over someone like Alabama or Michigan or Notre Dame, and that’s when, all of a sudden, the push for an eight-team playoff will gain some steam. We saw it with the bowl system before there was a championship game. We saw it with the Bowl Alliance. We saw it with the BCS. And we’ll see it with the CFP. We know this because of Bill Hancock. For years, he lauded the BCS as the ideal way for college football to determine it’s national champion and made a playoff sound like the worst thing that could ever possible besmirch the sport’s good name. Per Bleacher Report, he was quoted as saying a playoff would lead to more injuries, conflict with players’ educations, kill the bowl system, and diminish the regular season. Amazingly, as soon as the BCS folded under its own weight after one-too-many disputed champions and unfair snubs, Hancock changed his entire tune wholesale. In other words, everyone championing the four-team playoff will continue to do so until the eventual controversy that looms over the whole finally arrives (like Thanos looking for his Infinity Stones) and, all of a sudden, they’ll magically start to tell you that an eight-team playoff is, in fact, the true perfect system. It might happen as soon as next season or it might take a few more years, but we’re always one unfair snub away from all these money men changing their story. Or perhaps we should all just be listening to Mike Leach and go to 16 now, instead of doing this dance for the next decade.